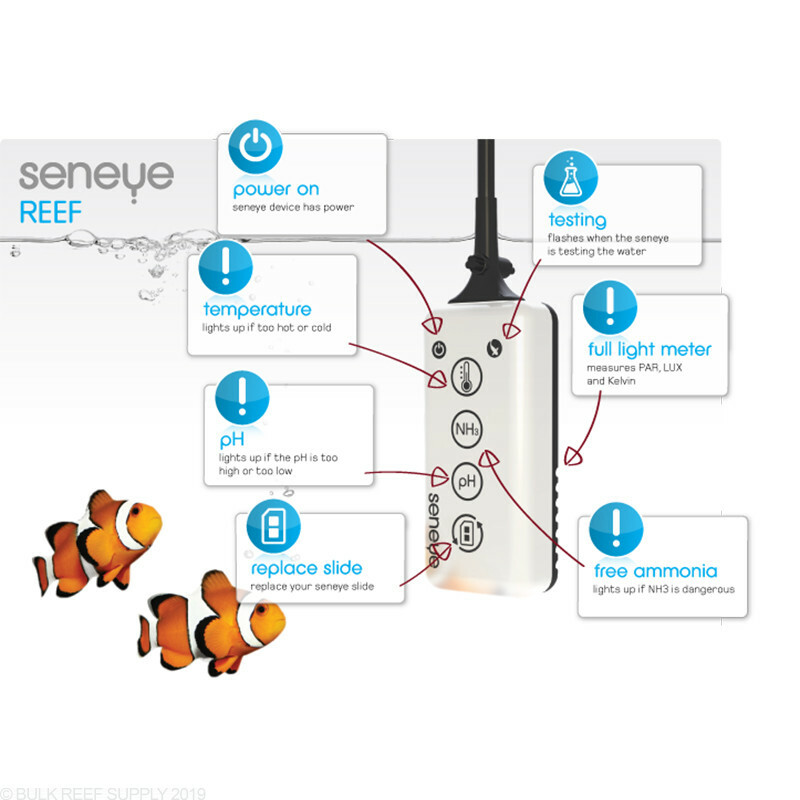 Seneye Reef Pack is an all in one monitor for Temperature, Ammonia, pH, Water level, and Lighting. 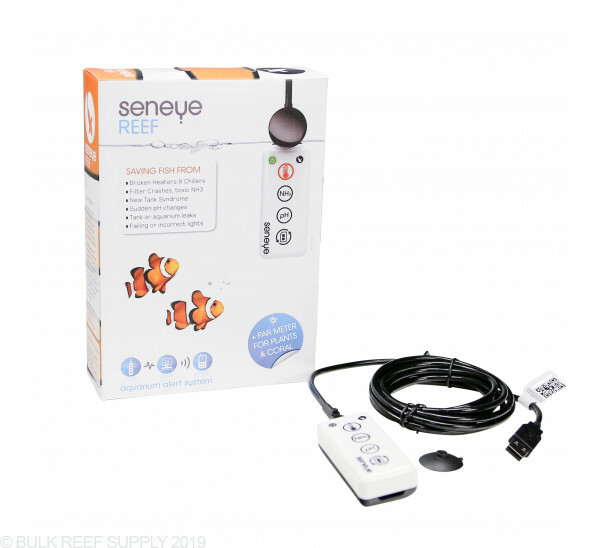 With a PC you can connect your Seneye monitor directly to any PC or Seneye Web Server to monitor your aquarium. 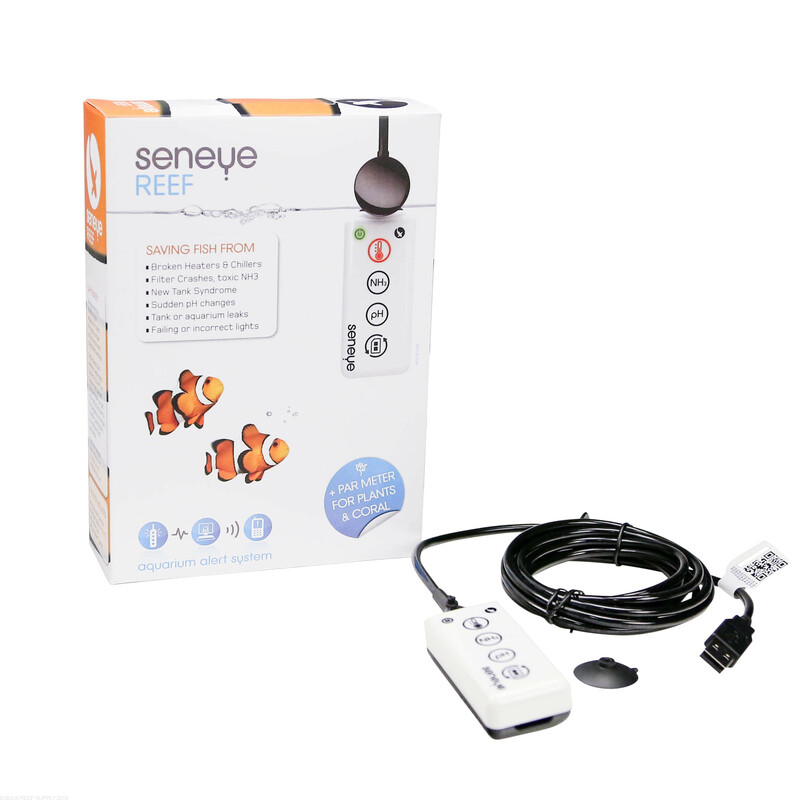 With the Seneye Web Server you can monitor your aquarium from anywhere you can get internet access via smartphone, PC or tablet. Windows PC with a wired or wireless network and TCP/IP protocol, Vista 32-/64-bit, Windows 7 32-/64bit. Installing the software brought me back to the clunky old days of Windows 98, but the Seneye serves it's purpose as an affordable PAR meter option, and for that I'm thankful. Would be nice to a wand option to assist with taking PAR readings throughout the tank. Got this looking for a monitor only solution. Had no idea i needed to have a computer running next to my tank to run it or fork out hundreds more for their web "server". On top of that inconvenience, you have to remember to replace the slides that cost you over a $100 a year and if you happen to be on vacation when they need changed - well - too bad. If you have a reef tank and are any bit serious, you need a PAR meter, end of story. I wish I bought this years ago. I was shocked to see what different PAR levels look like in person. Have had a couple of these now for more than a year. I don't use these for fine monitoring or control, I want them to let me know if something is really wrong. I think that's what they're meant for. On a couple occasions I got early warnings that my temp or ammonia was going outside norms and was able to correct the issue early and prevent disaster. That alone is worth it to me. The fact there is a PAR/PUR meter as well is a huge bonus. That alone would be worth the cost. Had this s out of water on shelf for 3 months. Put it back in water and it’s dead. Red light stuck on and screen says software issue contact seneye support. I did 3 times over the past 3 weeks and no response. I had troubles at the beginning and the instructions are pathetic. Everything is on the web and not organized. Once I found that you need to soak the card for 24 hours, everything worked great. Love that I can get everything on my phone. Even shows some extras that doesn't show on the computer. I would like to start by just saying I only use it as a par meter. So far I have been very happy with it. It appears to be accurate, but I don't have an expensive par meter to compare it to. I've done some very basic testing. When I put it in shadowed areas, the PAR goes down relative to non-shadow areas. When I pull it out and put it directly under my LEDs the PAR shots through the roof. Also my corals seem to respond as expected. For example, the low light corals that I have hate it when I place them where the PAR meter says it is high light. This is obviously not clear scientific data. But it seems to work. It is easy to use. It was easy to setup. I would recommend it to a friend. Bought it to use as a inexpensive PAR meter. readings were not even close to the Quantum off by 50% or more. BRS has a great return policy so I was able to return it. It keeps saying out of water and have to reset it every other day. For the money paid this is ridiculous. Reason I got this was because of able to measure par. Go get something better it's worthless piece of junk. I teach a marine science class and have 8 mixed tanks in my room. Changing the light settings for different coral types made knowing the par of each tank almost essential. Seneye meter works well for a quick way to get a good idea as to the par rating in each tank. I can turn up or down to get within an acceptable range for the organisms I'm most interested in growing in each tank. Has anyone come across this Par meter color graph discrepancy with their Seneye monitor? When I place my monitor in my refugium and compare the color spectrum graph between the real time app screen and the online dashboard screen, the color spectrum line peaks on the graphs are opposite of each other. In the refugium I am running a Zetlight E200 which is on the very red end of the spectrum. It shows up that way on the real time app screen. If I let it sit there overnight while the lights are on and then compare it with what it shows on the online dashboard for the same time span it is opposite. The dashboard shows it peaking in the blue spectrum overnight. Does anyone experience the same issue? Another issue I am experiencing now, on the dashboard screen if you click on the data point on the left side of the PAR window (Where it shows the date/time/PAR) the color spectrum line should show up on the right side of the PAR window. I have found that when clicking on anything above 17 PAR the color spectrum line goes flat. I have emailed them regarding this. It took a long time to get a response but this is a cut and paste of their response to me. "Sorry that is has taken us so long to get back to you. The axis on the light metre graph are showing the following: X – Axis is for the nanometre value, the Y- Axis is the percentage of the light that is being read. Regarding the screen shot you have sent through, it appears that there is a bug with that particular graph as it should be showing you a graph on the right hand side at every point you click on the graphic. We have forwarded this to our Developer for further investigation." "Apologies for the late response. We have forwarded your query to our engineering team. This is the first time someone has enquired regarding the accuracy of our light meter. We will have to double check regarding your query, please bear in mind that we will be closed over the Christmas period, but will try to get back to you at the beginning of January." On January 9th I sent Seneye another email asking "Anything new yet?" I know they get the emails because there is an automatic reply email from them stating so. I have yet to receive any replies back. So I'm left wondering, did I stumble across a known deficiency in their meter or did I just get a faulty meter? This is why I am asking if anyone else can duplicate this situation. If it is a known deficiency, can it be fixed with an update? If it is a faulty meter, can it be replaced? Or are those lines just programmed into it to make us think that it is actually measuring something? Just ignoring a paying customer in hopes that they will go away is a pretty sad way of doing business. If a company advertises their product as being capable of performing certain tasks, then it should perform as such. Anything less is false advertisement! If you can’t do so then call it what it is, AN	OVERGLORIFIED PAR METER. I purchased an Apex PMK PAR meter which matches it perfectly for PAR readings but does not require the additional purchase of a “Web Server with WIFI” for another almost $300.00 to connect wirelessly. With these issues unresolved from a nonresponsive manufacturer, I cannot and will not recommend this product!!! Does this work with a MacBook or does it require a PC? "At present we do not produce a Mac version of the seneye connect application so you cannot connect your seneye device to your Mac and upload data to seneye.me. This is the only aspect of seneye that is not Mac compatible. If you own a Mac and want to use a seneye device then we suggest the use of a seneye web server (SWS). This performs the task of uploading data to the seneye servers from your device. The SWS has a build in web page interface that can be used to view data locally and adjust the setting on the seneye device. This interface is fully Mac compatible, as to is the seneye.me dashboard." Is there any other equipment needed (purchase) to measure PAR? The Seneye will include all components for measuring PAR. 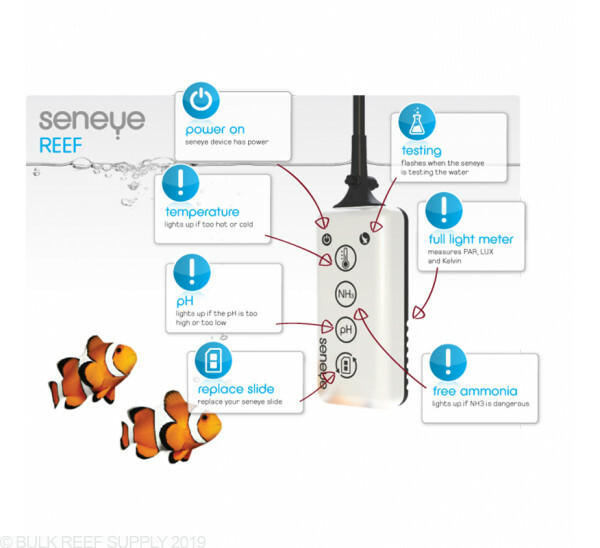 Does the Seneye ever need to be re-calibrated for things like PH or Ammonia? Is there a shelf life for the Seneye? The System will need to be re-calibrated for the pH and Ammonia. this can be done during the monthly slide change. There is not a shelf life however the slides will only last 1 month in the aquarium. Feel free to let us know if you have any further questions! I have heard there is an additional $60 fee to measure PAR. Is this true? There is no additional fee to measure PAR and it is built into the module itself. Will the light meter, temperature sensor, and water level sensor continue to function without purchasing new slides? They certainly will! Only the ammonia and pH will need refill with the disks. Does the device need to be connected to the Internet (via a PC or SWS) in order to measure PAR? Or can it store the data locally for later upload? If so, will it only measure once an hour? When plugged into a PC it will be able to monitor and read PAR levels every 10 minutes, Same with the web server. The levels will be kept and stored for viewing previous PAR levels. I have heard the device requires access to the Seneye cloud to process PUR and spectrum readings? Is this true? Is it only able to capture PAR and lux as a stand alone device? The dashboard display on the PC will work well even without the Could or server. Feel free to let us know if you have any further questions! 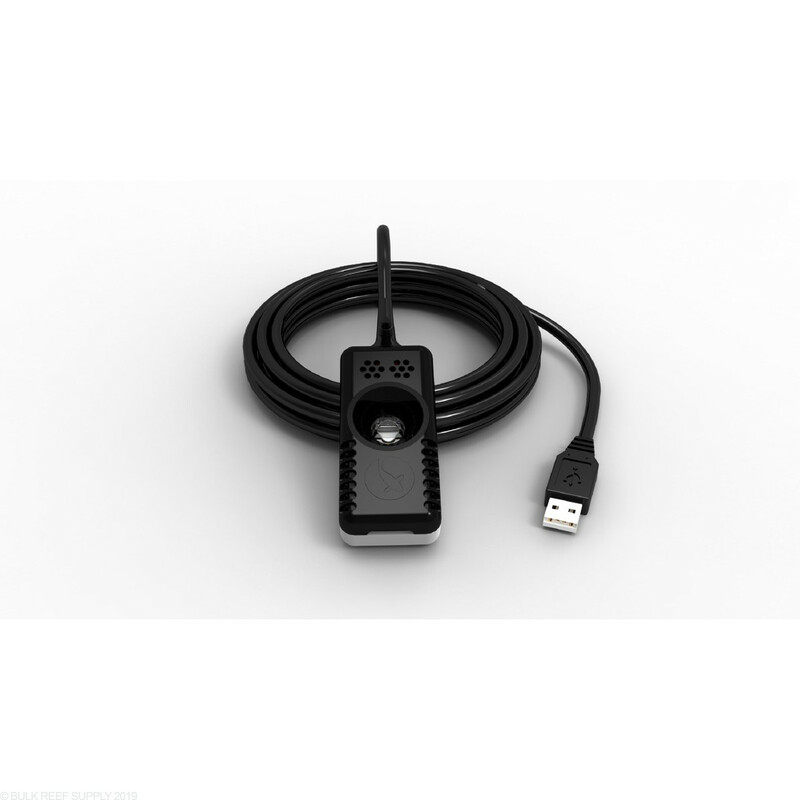 The Seneye has an 8' cable. If you have any other questions, let us know. How is BRS cleaning their Seneye monitors? Will vinager work? 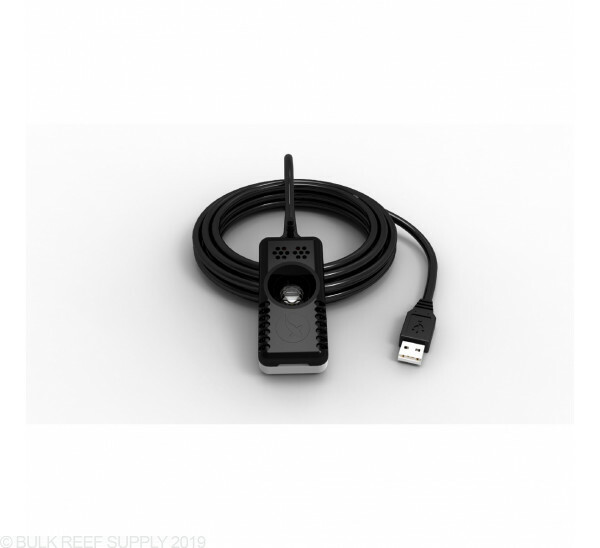 Due to the sensitive nature of the Seneye device, we only recommend using the Seneye Cleaner located here https://www.bulkreefsupply.com/seneye-cleaner.html. Avoid using any harsh cleaning materials or chemicals. There will be one included slide with the kit. It is a great idea to have replacement slides on hand for replacement in the coming months. Feel free to let us know if you have any further questions! Can I plug this gadget into an xbox one? We are not aware of any way for the software to connect unfortunately. Feel free to let us know if you have any further questions. How does this monitor measures light? Do I have to place it where I want it to take the reading? This will use a LUX meter similar to a PAR meter and can be moved around the tank to find the correct readings if needed. This is actually an ideal measurement device for LED lights. Feel free to let us know if you have any further questions! I is this device compatible with iOS devices such as my macbook air? This is not compatible with Mac or iOS however if you purchase the kit with the web server you can access the information through any browser. Feel free to let us know if you have any further questions! Right now there really isn't enough definitive information to give specific target PUR values. LUX and PAR are not really ideal measuring tools for determining spectrum and intensity for corals, but ultimately all of these values have more utility to measure relative areas of intensity within the aquarium. This information is helpful for placement of different kinds of corals, but because there is such a range of light tolerance, even within groups of corals such as Acroporas, it's nearly impossible to give a very tight range to shoot for. Can I limit the amount of time this is in the tank to make the cards last longer? for example if I use it for a hour several times a week would the card possibly last for a year? Unfortunately there is not a good way to save the discs after placing in the tank. They will lose performance if removed and dried regardless of drying or storage. Feel free to let us know if you have any further questions! The seneye is able to monitor all types of light evenly! For double ended bulbs we have had great luck with the phoenix and Giesemann. I have included a link below! Am I reading this correctly, the seneye reef will only take a PAR reading every 10 minutes? You cannot move the sensor around and see PAR in real time, like with the apogee? The Seneye will record a par measurement every so often, it does also give you live readings as well. You can take multiple measurements around the tank at one time. To measure PAR, will I need a PC as well? Or can I measure PAR with just the unit itself or by connecting to a Mac? Great question! 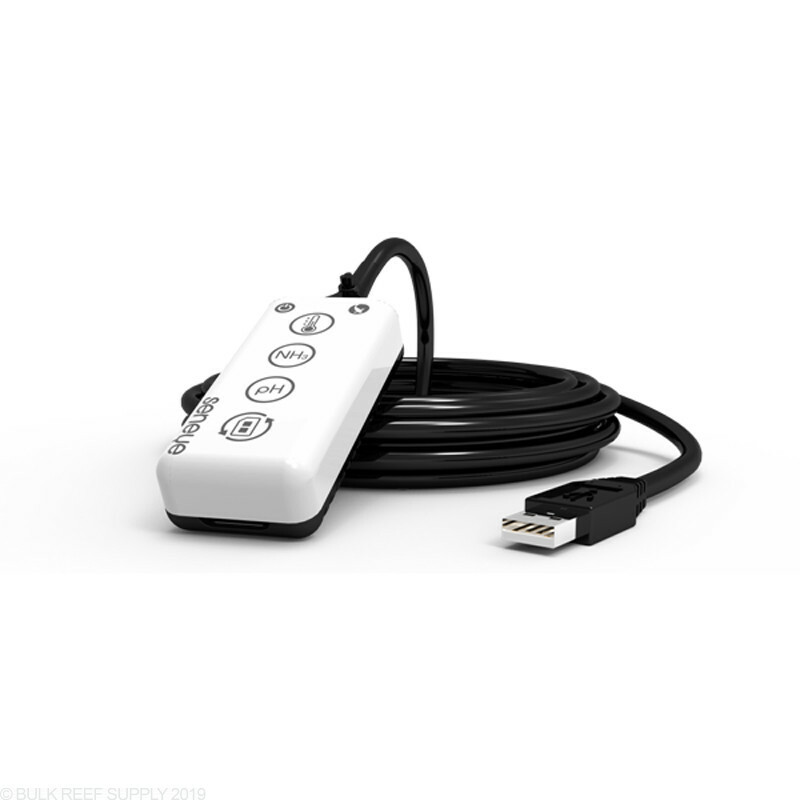 You will need a PC in order to use the Seneye as it is not MAC compatible. What is the accuracy of the temperature reading? Would this system work with a MAC computer? Unfortunately at present Seneye does not produce a Mac version of their software. If you own a Mac and want to use a seneye device then we suggest the use of a seneye web server (SWS). This performs the task of uploading data to the seneye servers from your device. The SWS has a built-in web page interface that can be used to view data locally and adjust the setting on the seneye device. This interface is fully Mac compatible, as is the Seneye.me dashboard. Does it come with the power adapter, and slides? The Reef Monitor does come with one slide. It is powered through USB that can be powered through any USB port. It does not come with a 120v or 12v power adapter, but they can be purchased separately. Can one unit work on multiple tanks? Or do we need to have more then one unit to monitor more then one tank? Great question! These must be submerged, in which case, you will need one monitor per tank.